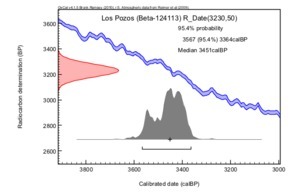 Esta muestra proviene del Elemento 1034, un foso pequeño no térmico en forma de campana en el punto "Sweetwater" de Los Pozos (Gregory et al. 2007:73, 81; Mabry 2005:115). 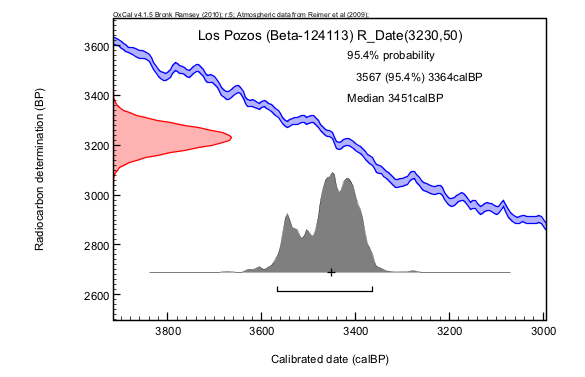 2007 Excavations in the Santa Cruz River Floodplain: Further Investigations at Los Pozos. Anthropological Papers. No. 27. Center for Desert Archaeology, Tucson. 2005 Diversity in early Southwestern farming and optimization models of transitions to agriculture. In Subsistence and Resource Use Strategies of Early Agricultural Communities in Southern Arizona, edited by M. W. Diehl, pp. 115-152. Anthropological Papers, No. 34. Center for Desert Archaeology, Tucson.